June 16, 2017 (Lakeside)-- Helix Water District (HWD) received a long-anticipated $8 million check on June 16th, officially marking the end of a six-year legal dispute over a 460-acre parcel of land the water agency owned in Lakeside’s El Monte Valley. 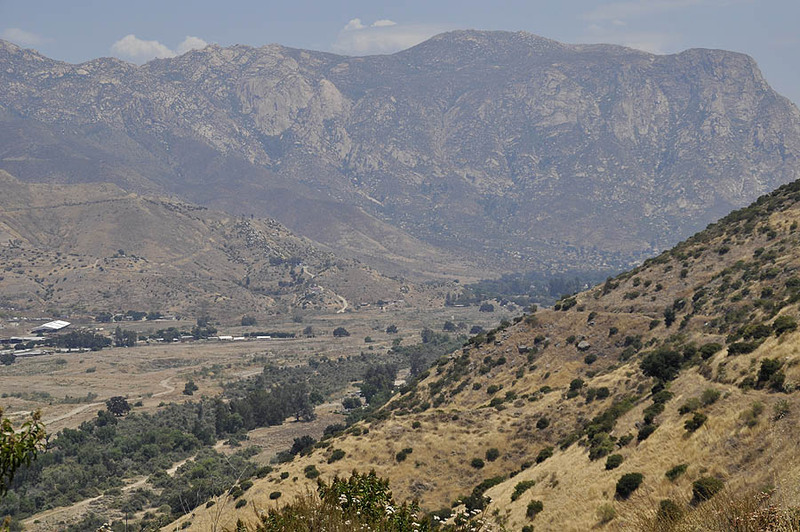 The land sale is the result of a 2014 court settlement between Helix Water District and the El Capitan Golf Club (now known as El Monte Nature Preserve LLC). The payment is good news for customers of the Helix Water District, where hefty rate hikes to balance budgets led to a ratepayer revolt and ouster of two incumbent board members last election. But the final payment dashes hopes of El Monte Valley residents and Lakeside community planners opposed to El Monte Nature Preserve’s proposed sand mining operation to extract 18 million tons of sand over 15 years from the El Monte Valley on the site. November 8, 2016 (La Mesa)—It’s rare for incumbents to be unseated. But Chuck Muse and John Linden, two incumbents who voted for repeated rate increases including an unprecedented five-year rate hike, appear to have lost their reelection bids. The apparent wins for Mark Gracyk and Dan McMillan are also victories for the local Democratic party, which endorsed both over the Republican incumbents, though the race is officially nonpartisan. It's also a win for ratepayers ired over repeated hefty rate hikes by incuments who promised fiscal conservatism. October 26, 2016 (San Diego’s East County) – Recently we interviewed Mark Umphres director of water quality and systems operations, and Mike Uhrhammer, senior public affairs representative from the Helix Water District. We talked about water rates, water quality issues including a recent state report on mercury levels in fish, and some exciting new additions at Lake Jennings—including tipis! You can listen now to a podcast of our interview by clicking the orange button above, or click "read more" and scroll down for highlights. Mark your calendars for our candidate forum with Helix Water Board candidates and Lemon Grove Mayoral candidates on Wednesday, September 21 at the Lemon Grove Library.Meet candidates at 5 p.m. with the forum starting at 5:30. September 16, 2016 (San Diego’s East County) – John Linden has served on the Helix Water District Board since 2000. He’s proud of his service and of the Helix district’s long history since its establishment back in the 1880s. He’s running for reelection in district 1, against three challengers. We sat down for an interview with Linden that originally aired on KNSJ radio. August 3, 2016 (La Mesa) – With scarcely any public notice, Helix Water Board passed a 10.3% rate hike by a slim one-vote majority. The stated reason was because water use has dropped due to customers conserving water--just as the district asked them to do. Directors Kathleen Coates-Hedberg and Joel Scalziti voted against jacking up rates, while directors John Linden, Chuck Muse and Deana Verbeke voted for the rate hike over public objections. August 3, 2016 (Lakeside) -- I caught this image of an egret at Lake Jennings, its vertical plumes striking a counterpoint against horizontal lines formed by rippling waters on the lake's glassy surface. For more LakeJennings photographs, click "read more" and scroll down. July 27, 2016 (Rancho San Diego) – The Water Conservation Garden at Cuyamaca College will host a free Customer Appreciation Day for Helix Water and Sweetwater Authority customers on Sunday, July 31 from 9 a.m. to 4 p.m. Discover different varieties of drought-tolerant plants, learn how to "Toss the Turf" and get inspiration on how to incorporate water-wise gardening into your own garden. Plus you can enjoy free activities including docent-led garden tours, tips on butterfly gardening, veggie growing,soils and native habitat, meet Ms. Smarty-Plants, watch a butterfly release, savor free shaved ice, and get discounts on gift shop items. See full schedule of events below. September 2, 2015 (La Mesa)—Helix Water District’s board will hold a public hearing on Wednesday, October 7 at 5 p.m. at its board room (7811 University Ave., La Mesa) to consider adopting rate hikes over the next five years. View notice of the public hearing on proposed rate hikes. The plan is drawing strong opposition including the Grossmont-Mount Helix Improvement Association, which is organizing a public forum on September 30 at 7 p.m. at Murdock Elementary School (4354 Conrad Drive, La Mesa). The GMIA is also urging residents to write to Helix to register formal opposition. The GMIA has posted a sample letter here. July 5, 2015 (San Diego’s East County) – Representatives from Helix, Padre Dam, and Otay Water districts spoke at a California Drought program hosted by the San Diego East County Chaldean-American Chamber of Commerce on June 24th in La Mesa. All three districts are working to make sure their customers comply with Governor Jerry Brown’s order for 25% cuts in water use statewide. But their approaches vary, ranging from educating consumers to offering rebates to one district readying to impose fines on heavy water users. May 21, 2015 (La Mesa)- At the board meeting yesterday, the Helix Water District board voted 4-1 for the drought action plan for increased public education and outreach, increased restrictions with two days/week for outdoor water use in tier 3, and a 10% penalty for using 31 units or more of water, effective starting with July 29th water bills. The plan also limits watering to two days a week and cuts warning for water waste fines to just one courtesy letter. View the resolution here. Tier-3 users will be charged 10% on water over 30 units each two-month billing period, but will not be charged 10% on the first 30 units, Mike Uhrhammer, senior public affairs representative at Helix, told ECM. A person who exceeds the limit by 1 unit would pay 55 cents; while 50 units would be $11.02, for instance. See chart above left for details. Average water use is 26 units over two months for the district. “There is a variance procedure,” Uhrhammer said, citing a need to irrigate for defensible space or erosion control and undue hardships as examples. The penalties will not apply to tier 1, which is considered essential indoor water use level, or tier 2. Tier 3 is targeted because these residents use water mostly outdoors and the state is pushing districts to encourage homeowners to limit ornamental landscaping. May 14, 2015 (La Mesa)- At yesterday’s board meeting, staff at Helix Water District presented a drought action plan and resolution to the board. No action was taken, with the measure slated to be brought back to the board for action on May 20th. If approved, the plan calls for tough enforcement and hefty fines of up to $500 against heavy residential water users who fail to cutback water use. February 17, 2015 (La Mesa) – The Helix Water District Board meets Wednseday, February 18 at 2 p.m. (7811 University Ave., La Mesa). The agenda includes a workshop on water rate structure cost of service. Oddly, as of Tuesday afternoon, the agenda packet did not include any details on a proposed water rate structure for the public to review prior to the meeting, raising questions over adequacy of public notice under the Ralph M. Brown Act. January 4, 2015 (San Diego’s East County) –Many hot agenda items are coming up before boards, commissions and councils across East County during this first week of the new year. November 18, 2014 (La Mesa) – Following a 10 News investigation that cited anonymous whistleblowers claiming corruption by a Helix Water District inspector and a construction company, the Helix Water District has responded to East County Magazine’s request for comments. Read highlights of the 10 News story with links to the full report here. Ted Salois, senior public affairs representative for the district, offered this response. “We strive to be excellent stewards of our customers’ funds and work diligently every day to continue earning the public’s trust. When some concerns about our contracting practices were raised, we immediately initiated our own internal audit and commissioned a thorough review by an outside firm," he said. Four candidates are running for two seats on the Helix Water District Board. We invited all four to be interviewed on our radio show and two of them responded. In our radio interviews, we asked candidates their views on the drought, creating new regional water supplies, the tiered rate structure, budget priorities, the future of Lake Jennings, and transparency, among other issues. Hedberg is an incumbent and civil engineer who is running as a ratepayers’ advocate. She voted against rate hikes passed by the board majority. Her opponent is Maria Mariscal, who has worked for the County Water Authority. Rotsart says he’s running because rates are too high, having nearly tripled in the past nine years. He He believes his experience in nonprofits will help him bring financial accountability to the board. He is running against incumbent Deana Verbeke, whose website says she is a voice of ratepayers but who voted consistently to raise rates despite objections from the vast majority of ratepayers who submitted public comments. September 2, 2014 (San Diego’s East County) – Just a few months ago, the future of Lake Jennings, in Lakeside appeared dire, with someHelix Water District board members ready to close it permanently or eliminate campgrounds. But a special committee was established to come up with solutions to save this resource for the public enjoyment--and the results are promising, based on a dramatic drop in losses and increasing use by the public. August 7, 2014 (La Mesa)--Helix Water District’s board of directors voted yesterday to put Drought Level 2 into effect in response to the State Water Resources Control Board’s passage of mandatory water conservation measures to deal with the current drought. September 26, 2012 (La Mesa) -- Lori Kern-Greenberg is running for the Helix Water Board against long-time incumbent Chuck Muse. In a questionnaire sent by La Mesa Citizens Oversight Group, she answers detailed questions on water rates and accuses board members of "lining their own pockets" while ignoring the needs of ratepayers in the district. "Water is not a commodity. It is not bought and sold on the stock market. Water is a necesssity and the board has a responsibility to the ratepayers to keep all rates as low as possible," she states, adding that she wants to change the tiered-rate structure so that everyone will pay the same rate. Update: Helix directors have voted to suspend the El Monte Valley Recharge project. September 4, 2011 (Lakeside)--This Wednesday, September 7, the Helix Water District Board of Directors will consider a staff recommendation to suspend the El Monte Valley Project. The project is a groundwater recharge and recovery operation that would generate 5,000 acre feet of water per year using an advanced recycled water purification process known to water professionals as Indirect Potable Reuse (IPR). July 19, 2011 (La Mesa) -- Helix Water District will hold an informational public meeting on the proposed water rate increase on July 21 from 6-7:30 p.m. at the La Mesa Community Center, 4975 Memorial Drive in La Mesa. April 23, 2011 (La Mesa)--On Wednesday April 20th, the Helix Water Board on a 4-1 vote approved the two year MOU negotiated by the employees for the employees with no rate payer representation. That’s right! Mark Weston and Lisa Irvine, employees of Helix Water were appointed by the Board to represent the ratepayers’ interest in the negotiations with the employees. April 21, 2011 (La Mesa) – By a 4-1 vote, Helix Water District’s Board of Directors approved a new two-year memorandum of understanding (MOU) for its employees. General Manager Mark Weston said the “new reality” reflects recognition that employees need to share in pension contributions and that Helix pay rates and benefits are competitive with other districts. But some ratepayers argued that the changes do not go far enough. April 7, 2011 (La Mesa)—Helix Water District customers won’t be getting smart water meters anytime soon. The Board of Directors opted against the change. “We don’t want to spend a million and a half dollars,” board vice president John Linden stated. The board also noted that among 322 pilot project customers who do have the smart meters, only 9 percent accessed the smart meter website to check their energy usage. April 4, 2011 (El Cajon)--Helix Water District has activated a 290 kilowatt (KW) solar photovoltaic (PV) system at the Nat L. Eggert Operations Center (OC) in El Cajon. The zero-emission system was deployed through a partnership with Borrego Solar Systems, Inc. and the California Center for Sustainable Energy (CCSE). To celebrate, the District hosted a ribbon-cutting event for the new system on March 30th.